I'm happy to report that I've had two sessions with my first private instruction student, Larry Ciccolo. Larry, I'd like to thank you for putting your trust in me, and for letting me write about it! He didn't realize he was my first victim, er, student, when he contacted me, but I told him when we were unloading my toolbox at his house. It's another milestone for me, and I appreciate the opportunity. I recognized Larry's name from the Sawmill Creek Neanderthal Haven forum, and he tells me he's a frequent visitor to CloseGrain. He's been a power tool user for many years, but recently has developed an interest in hand tools. He works in the high-tech industry, and told me one of the reasons he was interested in my instruction is that he saw I'm a software engineer. He says he knows software engineers are always interested in doing a good job (despite the, ahem, occasional bug!). 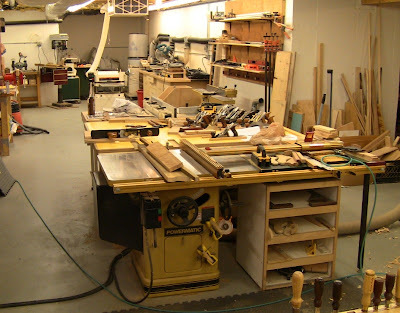 His basement shop is well-equipped, divided into power- and hand-tool workspaces. He's clearly been paying close attention to online tool discussions. Like all of us, he loves accumulating tools. 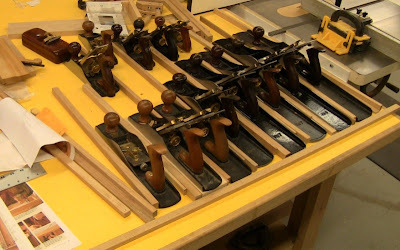 He has an excellent selection of Lie-Nielsen planes, chisels, and saws, as well as Bad Axe saws, several restored Stanley planes from Bill Rittner (rbent.ct@gmail.com) and Tablesaw Tom, and some wooden moulding planes from Matt Bickford. Most were bought new, but several items were good scores on eBay and Craigslist. He has a beautiful cabinetmaker's workbench that he built in a class at the Connecticut Valley School of Woodworking ("7 days of 12 hours!"). The vises are Lie-Nielsen hardware. The face vise is an LN chain-drive vise, and it's a joy to use. 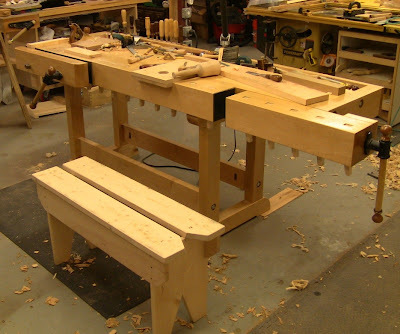 He's also a member of Shannon Rogers' online Hand Tool School, where the second project is building a split-top sawbench. This is a nice style, because it fully supports the workpiece when ripping, and deals with the problem of how to finish off the rip without cutting into the bench. I was unfamiliar with Bill Rittner and Tablesaw Tom, but a little searching online turned up several references. Chris Schwarz did a nice blog post about Bill's replacement knobs and totes. The totes are subtly different from the originals, but some quick handling shows that they would definitely be more comfortable over long planing sessions. A number of people on different forums recommended Tablesaw Tom's plane restorations. Bill also does full restorations. The planes Larry had them both restore were beautiful, rivaling the machining, fit, and finish of the Lie-Nielsens. Nothing has left the Stanley factory that nice since World War II. Now that Larry has amassed the tools, he's amassing the skills to use them. During our first session, we discussed options for organizing his workspace. He's working on a plane till that he wants to hang, and I went over my current method of storing everything on a tool wall next to the bench. For the second session, he had moved the bench out to the center, similar to my layout. 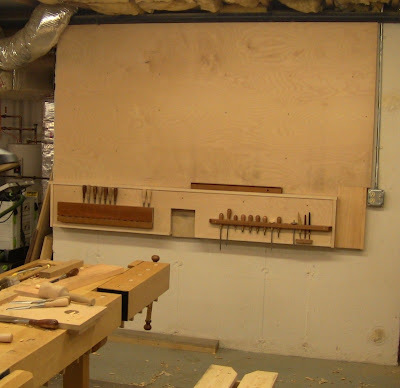 The future tool wall to the right of the bench. This is plywood screwed to 2x4's, which have been tap-conned to the poured concrete wall. The plane till will hang from this. View of the power tool area from the workbench. This is all subject to fine tuning as he gets some experience with the workflow and shuffles things around. Laying out the plane till. One of the benefits of private instruction is that the student decides what to cover, and how long to spend on it. 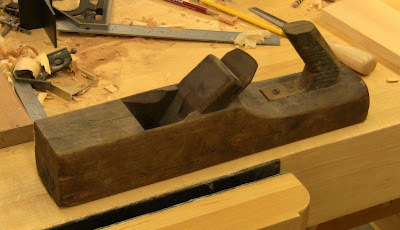 Larry's primary interests were basic sawing, getting full and proper use of his planes, and dovetailing. I like to teach by demonstrating a skill, then have the student try it, and together work out any issues that arise. Often, an operation needs to be broken down into constituent steps that we examine individually. Two of the things that came up are common themes with woodworkers new to hand tools. First is the appropriate degree of precision for an operation. I always like to have people rip down a long board, because no one ever thinks they can keep to the line. I get them started, showing them how to steer the saw, then have them deliberately go off course so they can correct it. Naturally, this leaves a wavy cut. Most people tend to want laser precision in this operation. I always point out that this is a rough operation, to be cleaned up in seconds with handplanes, no matter how bad off it is. Decide what tolerance you can reach at your present skill level, and leave that amount of margin. That's the appropriate degree of precision. Anything finer is wasted time. As long as you don't cross your finished dimension, any cut is acceptable here. The next steps produce an almost magical dawning. Starting with a heavily cambered jack or scrub plane, we quickly chew the edge down to near the line, then shift to a jointer. A few quick passes with the iron set rank to get really close, then set fine for the final passes. Suddenly you realize it doesn't matter how well the rip cut went, that first meat-eater of a plane tames the ugliest edge in no time. After doing his 4' rip cut, Larry pulled out a #6 that he said had a slightly cambered iron. I said, that's nothing, and pulled out the old wooden razee jack I had brought, since he had told me he wanted to see some wooden planes. I've ground that iron to an 8" radius. I also pulled out an ECE wooden scrub plane. I showed him how to use those to take big fat chips, taking down the high spots, or bringing the edge down to the low spots. He really liked the razee jack. We measured a chip with a dial caliper: 55 thousandths! That's the flip side of this lesson in appropriate precision. Save those 3-thousandths shavings for later, right now we need SPEED! This thing was reducing the wood nearly twenty times as fast. I told him what he needed was a cheap beater of a jack plane, iron cambered to 8". No point in spending the big bucks, it could be the ugliest dinged-up out-of-flat plane he could find, as long as it could hold an iron. He thought for a moment, then pulled a dusty old wooden plane out from a shelf. He said his son had found it inside a wall in an old house. The tote was an ugly user-replacement, there were end-checks in the body, and the bed was dished and cracked. Perfect! It was even a razee. I knocked the iron loose to check it. It was a nice laid-steel iron and chip breaker, but not much length left. Just enough for one good shaping and a few sharpenings. But it's easily replaceable with a flea market iron. So with all his fine planes, he can enjoy the irony of knowing this refugee from some distant past workshop will be his primary power tool for fast stock removal. With a new tote and a cambered iron, this will become Larry's meat-eater. After this we went through the FEWTEL sequence to four-square a board, then used several moulding planes on it. The second thing that came up is learning to relax, especially when sawing. You're body is really part of the tool. You want to move in smooth, fluid strokes, extracting as much power as possible without wearing yourself out. Under the pressure of doing a good job, it's easy to tense up, get a death-grip on the tool. For precision operations like sawing dovetails, this ruins your control. For rough operations like heavy ripping, this wastes energy. Correspondingly, heavy sawing and planing are the most laborious operations. They make you sweat, putting a lot of stress on the body, especially if you're not used to that level of activity. Again, relax, chill out and pace yourself. The tendency here is to try to become a human power tool, able to zip right through a board. That'll wear you out fast. Find the steady level you're able to maintain, allowing you to work for extended periods while keeping it enjoyable. Take a break and catch your breath. In the long run it's far more efficient than trying to race through a board and exhausting yourself, or worse, hurting yourself. Those were the broader lessons. When we got to the nitty gritty details of dovetailing, my main point was that I'm just showing one possible way; treat that as a baseline. There are many variations, everybody from the micrometer folks to the shoot-from-the-hip folks. From the fundamentals, you can branch out to all the other methods and decide which ones you like best. Once again, Larry, thanks for the opportunity!